Busting (or not) the mid-20th century global-warming hiatus | Watts Up With That? Seems hardly likely, considering Dr. Sullivan’s response to Representative Smith’s request and the previous press release. NO, and most certainly NO. Anyone having hope of the truth from government agencies at this point, should watch Sen. Ed Markey’s performance during the recent Senate hearings (covered here at WUWT.) The truth about matters climate, does not fit the agenda of those who would increase their control over you and stick their hands further into your pocket. This is thorough and detailed. Requires an answer from Karl, but it will never surface. So the uncertainty greatly exceeds the adjustment, but not disclosed so as not to affect the impact of the paper. I cannot find those figures in Kennedy’s paper, and it seems ristvan can’t either. Nick, go back under your bridge and have a great day! Here’s another example of GISS being out of step with reality. Correction : satellite temperatures (as they are recorded in your system) are out of step with reality, as we can feel it on the the earth’s surface, where we all live : phrenology, animals behaviour etc. …we can feel it on the the earth’s surface, where we all live : phrenology, animals behaviour etc. I suggest you study a little more from what I’ll presume is your climate-controlled environment that has separated many on the planet from what is actually happening outside. I have a number of relatives who were alive in the scorching 1930-1940 era in the US who simply laugh at the comparisons between now and then. You’re largely being lied to, Francois. And oh by the way, yes it does appear that the globe is warming slightly over the last century and there was a period of warming in the 1980-2000 timeframe (which is completely in line with earlier periods in the late 1800’s and mid 1900’s; not unprecedented at all). Where is the evidence that refutes the null hypothesis that this was largely natural cycles? Nope, sorry, models are not evidence. Sorry, it is getting clearer all the time that CO2 is not the significant control knob that you’ve been told repeatedly that it is. What you have is faith, not evidence. Let’s get back to dealing with local pollution issues, back to nuclear energy as the transitional energy source, back to getting more efficient with resource use, and let’s spend our precious resources dealing with actual slow climate change effects by modifying our infrastructure where needed. Let’s stop lining the pockets of enviro-terrorists, liberal politicians and liberal industry leaders through corrupt carbon trading schemes, corrupt subsidies to the green energy industry house of cards, and taxation/penalties which simply steal from the poor in rich countries to give to rich people in poor countries. The warming that we’ve seen over the last century and even over the last 30 years appears to be largely beneficial to plants, animals and people. Slowly, that evidence and story is coming out as it becomes so painfully obvious to most of us that the agenda increasingly becomes an obvious inane comedy. The saddest part of this whole thing for me is that policies from enviro-whackos keep killing real people who need our help the most—and seeing these whackos then try to take credit for saving the planet. You can ‘feel it’? Like you can feel the rise in CO2? No, you’re just being told, and now you’re head-nodding along with the people who are telling you that. But you don’t really ‘feel’ any unusual changes. You just think you do. Your belief is real to you, but it’s not real. It’s in your head, which is in the lower troposphere. Your specious “surface” argument fails because satellites measure the lower troposphere — where you live. The troposphere begins at the surface. Furthermore, the question has never been the temperature; it has always been the temperature trend, which satellites accurately show. The ‘earth’s surface’ argument is just the latest in a series of failed attempts to try and claim that satellites are no good, and that global warming is continuing like it always has. That is not true. Satellite data is the most accurate there is. It shows that global warming — the trend — stopped many years ago. You’re being lied to, François. But there’s a cure: don’t let others do your thinking for you. Start thinking for yourself. I thought one was supposed to recognize the flaws in data sets, not “correct” the data set and then base an argument on the “corrected” data set. The data are “adjusted”, but that does not mean they have been “corrected”. If the sensors are in calibration, the data are correct, if perhaps depicting “An Inconvenient Truth”. Why not using satellite data, thus eliminating weather station related biases, and covering evenly the whole sea surface ? Because the satellites prove the AGW crowd wrong. Far easier to add a mass of “adjustments” to the data from the buckets and buoys to get the desired result. Yet as seen in the latest lower troposphere numbers, the dataset currently runs 12/1978 to 11/2015. So where did you pull out the data for “base period 1961-1990”? 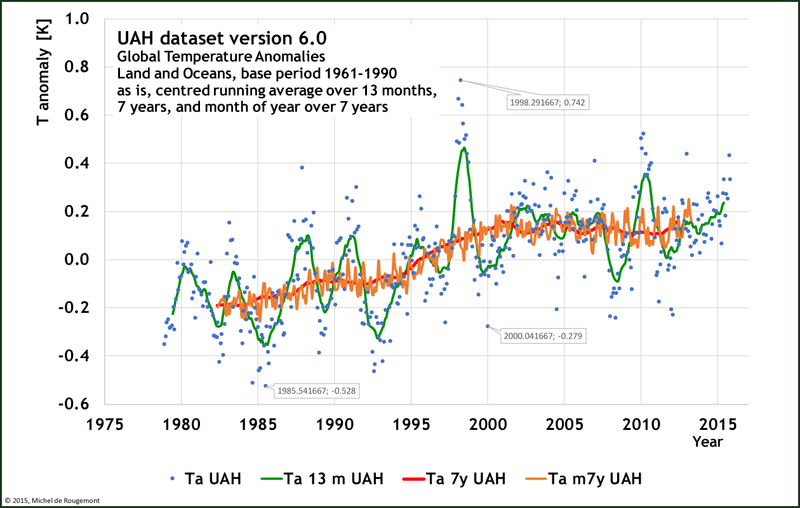 UAH follows the commonly admitted reference average temperature 1961-1990 as the “zero anomaly”. Given that during the Second World War most shipping in the North Atlantic travelled in convoy, it would be interesting to compare readings taken by different ships at the same time of day in the same convoy. Not sure if any of the hard data in the form of the observation records survives, though. How come there is never any discussion on this blog about the affects of geo-engineering, and I mean the spraying of the atmosphere via the plane??. Please, no comments suggesting the opposite, because I have a Government Act that suggests it has happened/happening or will happen. There are also Corporate websites who openly admit to providing such a service; for insurance companies, municipalities/cities etc. I believe this is a very important subject, given how it would INFLUENCE the numbers in favor of warming or against it. Some say the pause in warming coincides perfectly with the timing of geo-engineering, that some say aggressively began in the late 90’s. With regards to the last statement; this I cannot prove as I haven’t looked into the timing of such missions. FYI: I’m strongly against any tampering of Gods beautiful atmosphere. I love it the way it is. Do you have anything or say or what? Remember when a person could just look up at the clouds and remark on how beautiful and awe-inspiring the sky seemed. Alas, those days are now gone. A large section of the public now immediately form some unjustified interpretation involving either “chem-trails” or “extreme-weather”. For those people something is always slightly wrong and worrying. At least there are still a few minds in which – it’s just the sky – doing what it’s always done. With a few extra con-trails thrown in, due to the increase in air traffic. Maybe one day, people will learn to regain their innocent enjoyment of the weather. I’m NOT the one who used that word Alan! It was one of your followers. Is geo-engineering forbidden from subject matter? I believe this issue is geo-engineering. You people are so quick to disregard those trails and make me look like i’m the nut, but yet there’s no discussion about why you forbid such subject or why you or anyone else haven’t made a case for why it isn’t happening. Again, no substance, just trolling as usual. Whenever you want the proof coward, just say when. Otherwise you’re just another online sock puppet. Clearly you and your confederate have nothing to say in favor or against. Got any proof or brains? If you have ” proof ” , why didn’t you link to it ???? make sure you read the interpretation. Now why would Canada (Her Majesty) need to write up an act? Preventive medicine….You don’t have to wait for something to happen BEFORE you act !!! Very simple….. Cloud seeding is old technology and not very useful. The Canadian Statute refers to this practice. Also, you are trolling as you are off topic. Your answer: “Preventive medicine….You don’t have to wait for something to happen BEFORE you act !!! Very simple”….. Whether on a small scale or not, inert or not; do you believe that various corporations and or government agencies either have, currently are, or are planning to engage in weather modification? Anyways i’m done. Weather mod is happening all over America and Canada- benign or not, I don’t give a damn, its retarded! Its not some covert operation, its out in the open. See Go Canucks ( Canuck, that’s me ) reply to you….It has nothing to do with Global temperatures !!! Its not off topic, its directly related to the climate change/global warming topic. You cannot have a discussion about climate change and not take into account weather modification- small scale or large, it all has some affect. Maybe its not very useful, but it still doesn’t excuse the fact that they are doing it. Why? Why go around spraying salts and silver? I’m trolling……… give me a break!!!!! I think kenin is right, and WUWT et al, is wrong about this topic.. The act you refer to was designed to cover cloud seeding basically. The use of silver halides to provide a nucleus for water condensation leading to rainfall. That is not chemtrails etc. just a bit of 50 year old technology that is a bit iffy at best. The most notable change in the SST archive following December 1941 occurred in August 1945. Between January 1942 and August 1945, ~80% of the observations are from ships of US origin and ~5% are from ships of UK origin; between late 1945 and 1949 only ~30% of the observations are of US origin and about 50% are of UK origin. The change in country of origin in August 1945 is important for two reasons: first, in August 1945 US ships relied mainly on engine room intake measurements whereas UK ships used primarily uninsulated bucket measurements12, and second, engine room intake measurements are generally biased warm relative to uninsulated bucket measurements. 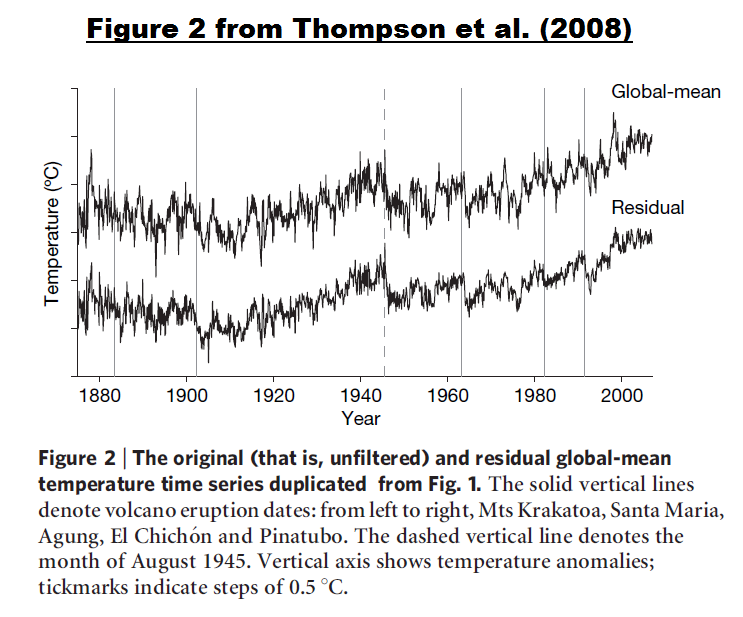 Consider the graph of global surface temperature anomalies furnished as part of the press release for Karl et al. (2015). See my Figure 12. Note that the trend line starts in 1951. 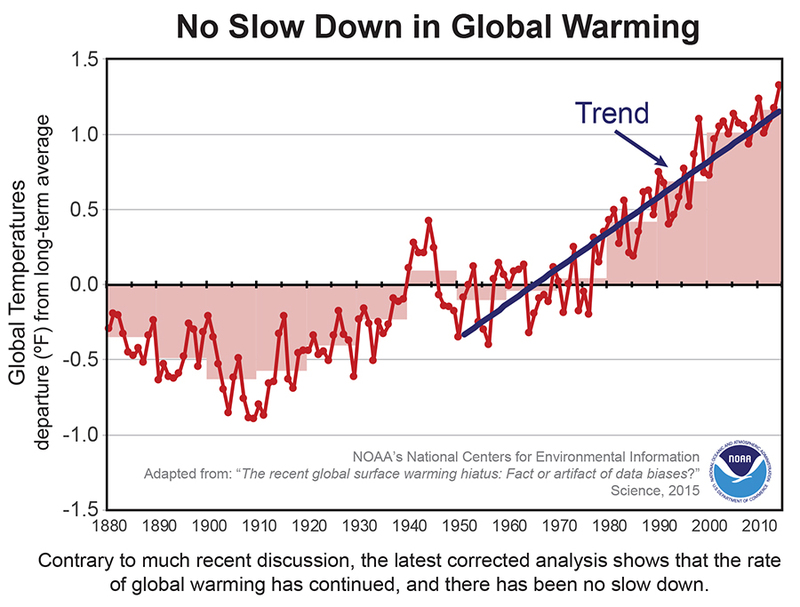 In other words, not only has NOAA endeavored to eliminate the slowdown in global warming in recent years, NOAA also appears to be attempting to eliminate the slowdown (or cooling) of global surface temperatures from the mid-20th Century to the mid-1970s. 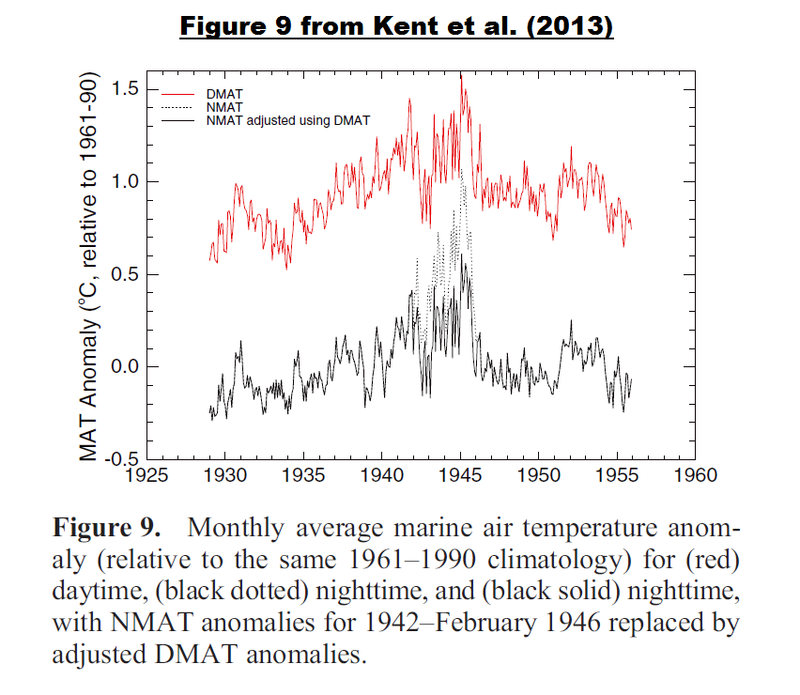 WW2 biases in NMAT are adjusted using daytime marine air temperature anomalies, as in previous data sets. The adjustment appears to have slightly better results than that used in MOHMAT4 and is applied over a shorter period. However, comparisons with collocated land anomalies suggest that HadNMAT2 remains too warm during WW2. Further investigation of the daytime marine air temperatures is therefore required. IOW, it’s not just the drop from 1945-49 which may be spurious, but the runup from 1938-44 as well. Nice try, Brandon. Can you see the difference in the 1951 starting point in Figure 13? How else would you explain the disparity between the ERSST.v4 and HADSST3 data? See Figure 11. The 1938-1944 “runup” in the ERSST.v4 data certainly looks odd, especially in the Southern Hemisphere. Looking at Figure 3, the HadNMAT2 data do not support the ERSST.v4 data during that time either. Also, that still doesn’t explain the difference starting in 1951. Can you see the difference in the 1951 starting point in Figure 13? How else would you explain the disparity between the ERSST.v4 and HADSST3 data? What I think is that the spike at 1943 is spurious and that neither team have adequately corrected it. I can only speculate why that would be the case, and must also consider that I’m quite wrong about the corrections being inadequate. If you had read Thompson el al. you would have noted that the problems continued into the mid-1960s. … since net adjustments for HADSST3 over the entire interval are in the cooling direction. I have difficulty imagining that the net adjustments to ERSST don’t exhibit a similar net negative from raw to final product. Brandon, blogger AK over at Judith Curry’s found a link to a not-paywalled copy of Thompson et al. Isn’t the main point that we are looking at less than 1 degree C increase since 1880? The appearance of rising, flat, or cooling temperatures depends on which length of time you choose for your graph. Recent experience is the most relevant- 1/3 of the anthropogenic influence on climate since 1750 has occurred in the past 18 years 8 months yet temperatures have not risen in that time. But at the end of the day it has risen less than 1 degree. Many of the early temperature readings have been adjusted and there is uncertainty as to their accuracy. Measurement of temperature in terms of variation from an average rather than plotting the baseline temperature creates the illusion of significant increases and this has happened because of the newness of climate science and the lack of defined procedures. Does a world average temperature have any real meaning at all? This possible small increase in temperature has not resulted in any increase in natural disasters so why are we about to spend so much money on a misdirected effort to stop further warming? Because some people really get it hard when they see a windmill or a solar panel and demand the rest of us destroy all our present forms of power to satisfy their utopian fantasies. Some people look at the guaranteed monetary returns from subsidy farms and in today’s economy they are the only guaranteed high return. Threaten to take away that trough and they will pull all the strings at their disposal. Similarly, politicians look at the ability to control world energy usage and salivate at the taxation and power possibilities. So bankers and politicians have yet again formed an alliance to make money and take power. Of course they will be upset if anyone throws any grit in the gears. Hence Senator Markey’s strange performance. In a post like this, you ought to include the rate of warming for the period ~1910 to ~1945. This was before there was significant emissions of manmade CO2, and even the IPCC does not suggest that that warming episode was anthropogenic in origin. The fact that manmade CO2 emissions post 1950 have not caused the rate of warming seen between ~1910 to ~1945 to increase suggests that CO2 at current levels does not have a material impact. 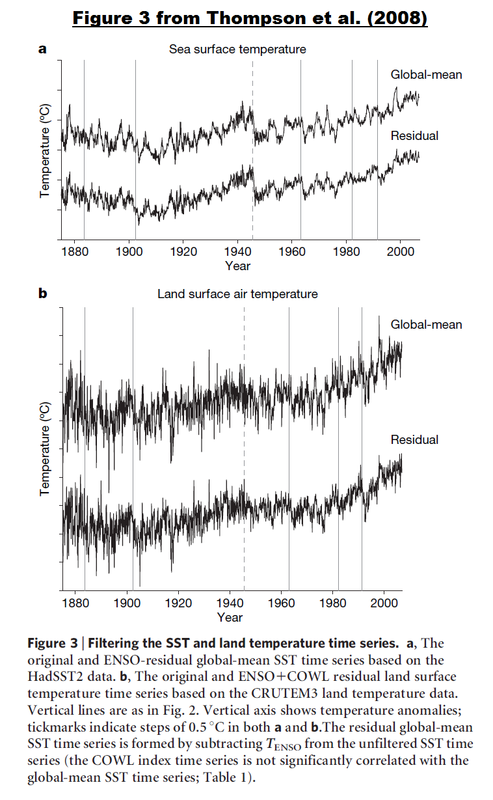 Until the warming episodes between ~1910 to ~1945, and the earlier warming episode in the 1860s can be adequately explained, it would appear that all the warming seen in the 20th Century is nothing other than that driven by natural variation. 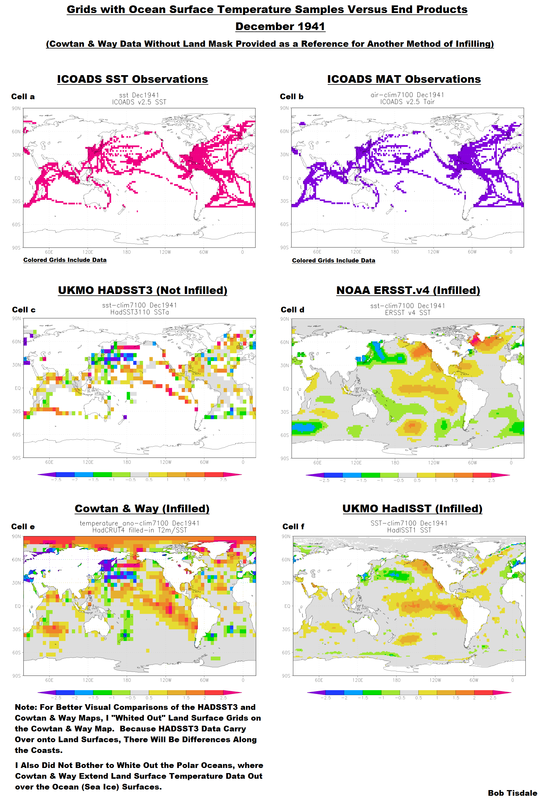 The NOAA plot figure 12 is very revealing. Whilst it is used to help promote the cause by claiming that there is no slow down in the rate of warming into the 21st century, it is damning in that is clearly shows that there has been no increase in the rate of warming that was seen in the warming episode between ~1920 to ~1945. I consider that in a post like this, you ought to include the rate of warming for the period ~1910 to ~1945 since this was before there was significant emissions of manmade CO2, and even the IPCC does not suggest that that warming episode was anthropogenic in origin. Richard, the early warming period is another topic of discussion. I understand that, but it is relevant to the revised NOAA (fig 12) plot. NOAA claim that the warming has not stopped, well Yes according to their plot, but then that immediately begs the question that the earlier warming episode has the same or greater rate of warming and was not manmade in origin. What other field of physical science would dare claim any degree of precision in their data, considering the uncertainties inherent in past measurements of “global temperature and the huge gaps between data points? Folks like Bob Tisdale deserve all the credit for using their genius level understanding of numbers and statistics to navigate through the mess, and explain it to us, but consider this – if mere “technical adjustments” to the data can result in a significant change in overall global temperature trends, what does that say about the underlying process and the significance of any conclusions? Nothing positive from my admittedly intuitive and naive perspective. Am I missing something or is it all like trying to split hairs with a dull pocket knife? You’re absolutely right. 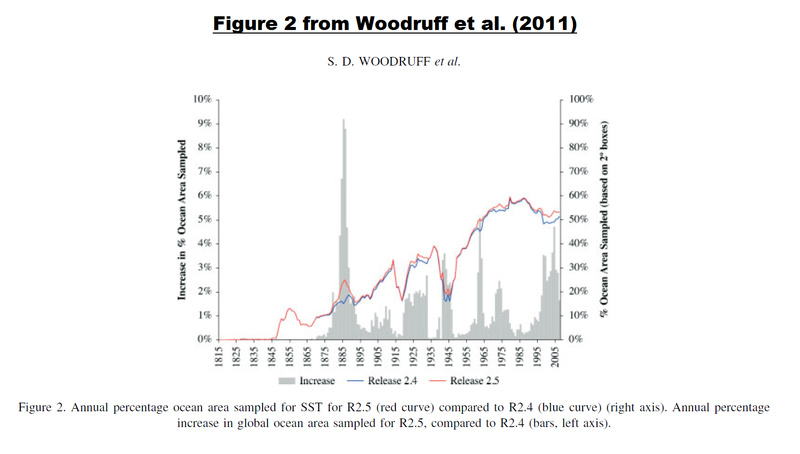 I looked at the Hansen study that’s at the heart of the “land-based” temperature record and most of it is made up out of thin air…..yet government agencies use that as the core of their “scientific” pronouncements of doom. What we are looking at is very bad science. Their hypothesis has failed over and over yet they continue to beat it as the drum of fact. In a media culture that sells fear on every level, these guys have found a very warm place to insulate their scientific incompetence from the cold light of reason. The politicians and media love them. They provide an excellent source of fear to keep the masses in a state of consumeristic anxiety, especially since all their scenarios of horror occur in the future, always in the future, always beyond the grasp of present reality. “If you want to control people, lie to them.”…L. Ron Hubbard. So a new cult religion is born: the Church of Anthropogenic Global Warming. In CO2’s highly exaggerated forcing they trust. Their religious symbol is a windmill. Their Satan is a lump of coal. True science is their sworn enemy. Madmen on a mission of world salvation. 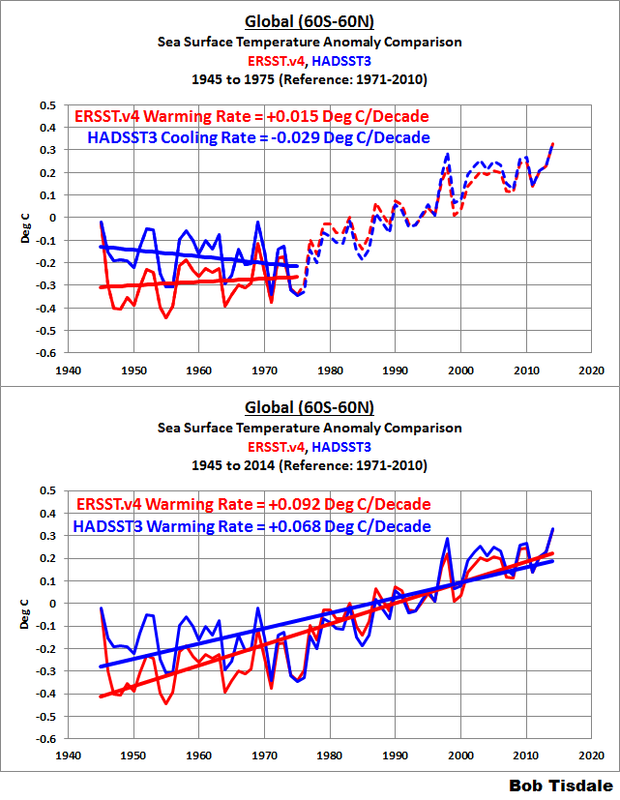 Recognition that there is nothing to cause true significant rise in global temperature raises suspicion of any assertion that global temperature is actually rising. Carbon dioxide has been erroneously suspected of being a forcing on global temperature. Compelling evidence, CO2 has no effect on climate requires only (1) Understanding that temperature changes with the integral of the net forcing (not directly with the instantaneous value of the forcing itself). And (2) all life depends ultimately on photosynthesis which requires CO2. The 542 million years of evolution on land required substantial atmospheric CO2. The integral of CO2 (or a function thereof) for 542 million years could not consistently result in today’s temperature. Documented in a peer reviewed paper at Energy & Environment, vol. 26, no. 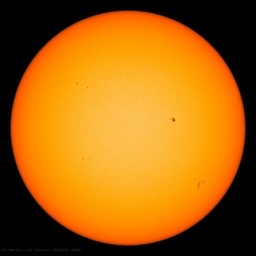 5, 841-845 and also at http://agwunveiled.blogspot.com which also identifies the two factors that explain climate change (97% match since before 1900). Your sharing of relevant data shows the real world. All of the individuals involved in climate data collection (excluding the UAH folks Christy and Spencer) have staked their careers on the global warming theory. We are talking about substantial salaries and substantial prestige and power here. If you were in that position and were also allowed to just change your assumptions whenever the numbers didn’t work for your theory anymore (ie. just write a paper about a possible way of looking at it and then double the adjustments you implement versus what your paper said was possible), would you do it – protect your career and prestige? You might and they did. Nobody can fix it now. We can only stop using these adjusted numbers now and just note to everyone who uses them, that they are completely unreliable and shouldn’t be used anymore. 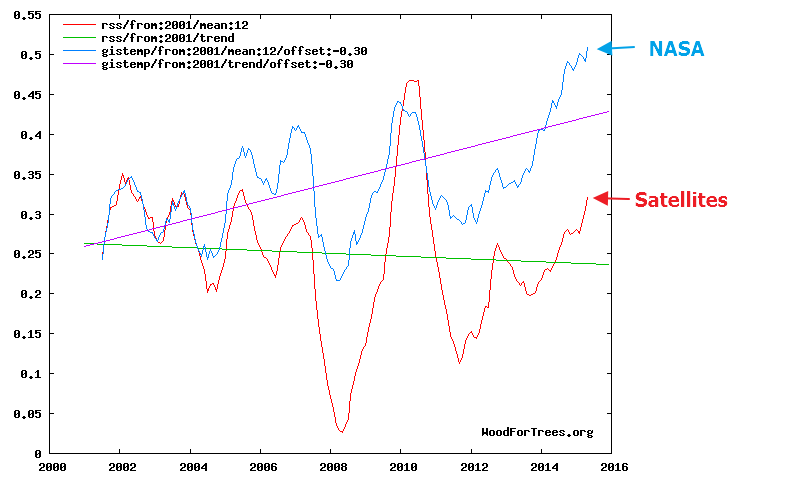 Karl 2015 is just unreliable musings about what the climate would be if we wanted unreliable numbers. I wonder what short term gain can cause people, not one but several, to take actions knowing that the history of science will group them with Trofim Lysenko. …If you torture the data long enough it will confess to anything !!! Agree. Somewhat OT but whoa, what a gnarly Gulf of Alaska “blob” in 1911! Makes the last couple year’s efforts milktoast. Dec. 1941 HadSST1 shows blob about equal to this year, but contradicted by HADCRUD. Quality Control of ERSST4: One first step could be to calculate the year-to-year differences of the global record and the 2-sigmas of this record. I’ve done it: http://kauls.selfhost.bz:9001/uploads/ersst4qm.png . So the years 1916,1946 and 1999 are very suspicious ( more than -2 sigma) and the years 1972 and 1977 ( more than +2 sigma). The ERSST4 would not pass one of the 1st steps of QM. It did. Nothing more to say! Can I ask a stupid question that has been bugging me for a while? 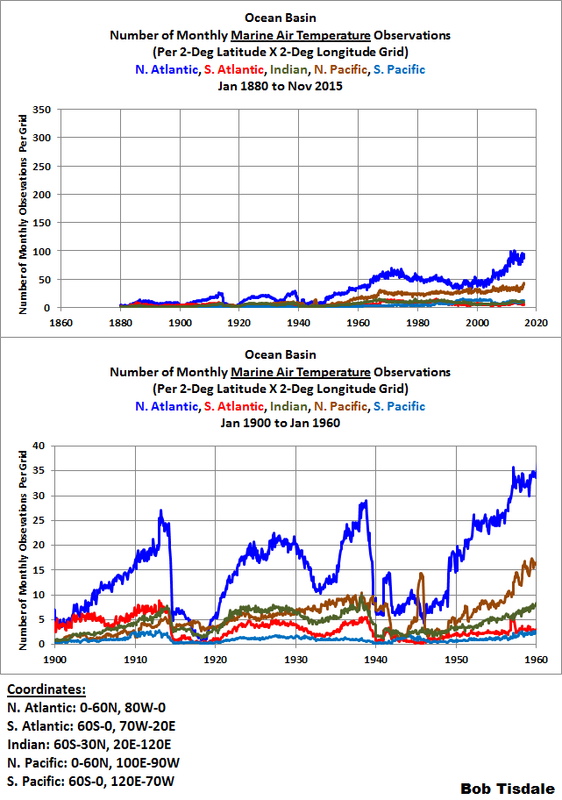 Why are historic temperature graphs so jagged? I mean, I can understand some seasonal temperature fluctuations over the course of the year. After all, the part of the earth that is most directly facing the sun is changing throughout the year therefore the effective albedo of the earth is changing too. Depending on the time of the year, the ratio of land-to-water that is getting the most sunlight is going to change as well. 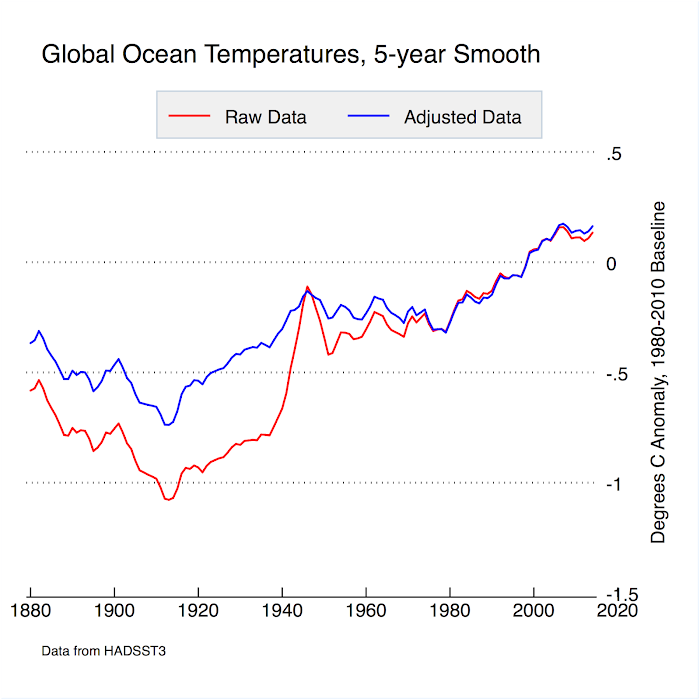 Therefore you might get some times of year where the whole of the earth’s oceans may be warmer than other times, etc. Maybe other times of the year the whole of the earth’s land surface temperatures are hotter or colder too. But I would expect these changes to be gradual over the course of the year and to be pretty regular from year to year. 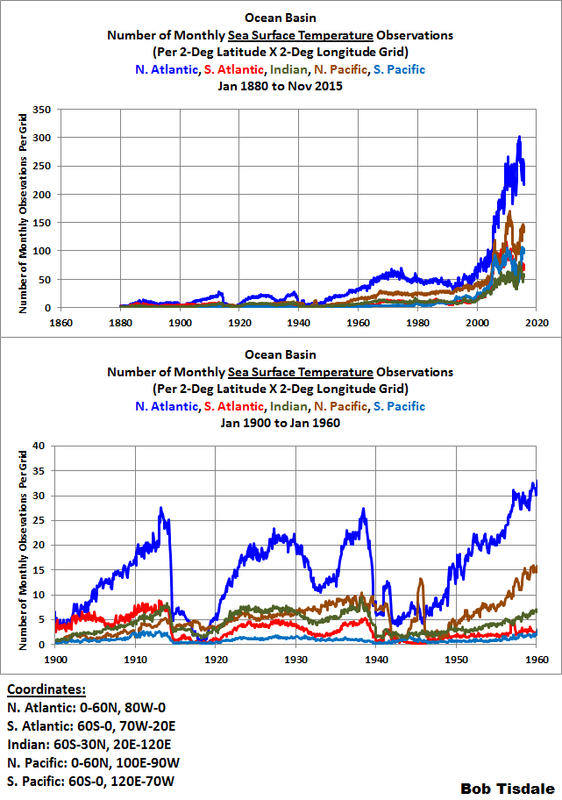 In general, I would expect all of the heat sources and sinks that affect global temperature to average out and thus aggregate measurements like “global surface temperature” or “southern sea surface temperatures” to be pretty static in the short term. So it seems like temperature graphs should be much smother than they are. 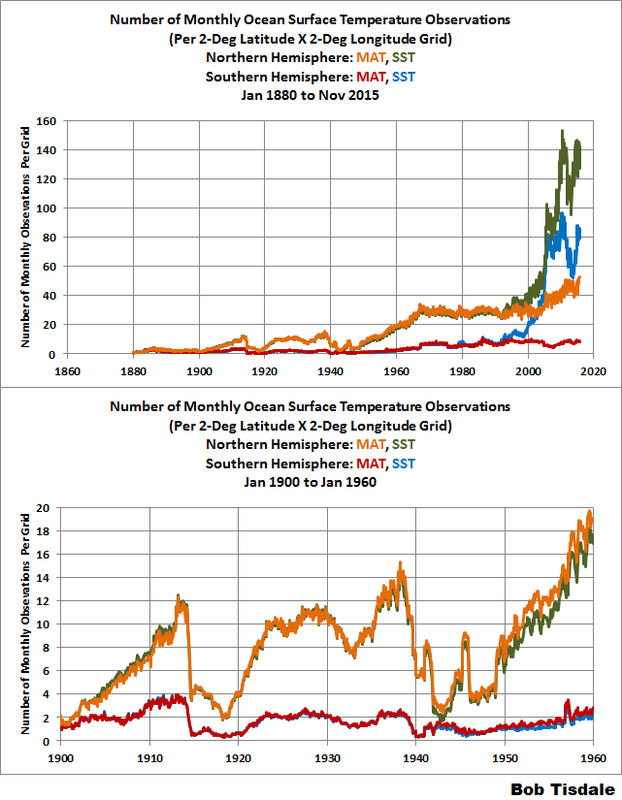 More like the charts we tend to see for atmospheric CO2 content. Basically, a regular-looking sine wave that doesn’t vary much from one year to the next but may show some more significant trends over the long term (if for example, the sun’s irradiance is increasing or if CO2 content does have the forcing effect that is claimed). Instead if you look at these charts you see all these jagged peaks and valleys where temps go up and down by .2 degrees her .4 degrees there, which seem to happen on multi-year cycles. E.g., some of these charts show a huge increase in the 40s followed by a huge drop off. What would cause that? I can’t help but wonder if we are kidding ourselves that all these peaks and valleys are meaningful at all. To me it suggests that our ability to truly measure these aggregate temperature values isn’t quite as good as we would like to believe and that these peaks and valleys really represent noise. I would not be surprised if we are kidding ourselves. In my opinion there is no proper assessment of the error bounds of these data sets. Someone needs to explain the large variation. What caused it? Eg., different patterns in cloudiness? different patterns in jet stream circulation? different patterns in water cycle/precipitation? different patterns in ocean heat content and circulation of currents? In particular, what is the difference in the forcing required to create these changes and where has that forcing come from, or how has it been subdued? etc etc. Until we can explain what is going on naturally, we have little prospect in reasonably estimating what drives climate and future changes thereto. Amazing work here . .. thank you. Bill Illis is spot on. Scientists are subject to the same motives and weaknesses as mere mortals–Gasp! They are driven by ego, by the need to fit in with their peers and even driven by what affects their pocketbooks–Double Gasp!! Science progresses through the process of peer review and from contrary opinions. It is often somewhat messy and cloudy as to how to interpret data. But many would rather claim infallibility and promote the idea that the matter is settled rather than honestly acknowledge the give and take that any scientific idea must embrace and proceed through.